Child friendly? :Children who are easily spooked by creepy themes may want to avoid this movie or risk having trouble sleeping. The premise is dark and includes some unnerving threats that imply harm toward children. The "other" parents are a bit threatening and may also be scary to younger kids. There is also a long scene in which two older, overweight women perform a dance wearing very little clothing. May be best for ages 10 and up. 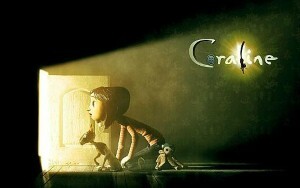 Coraline is a dark and imaginative fantasy, based on a book by Neil Gaiman. It tells the story of young girl who is frustrated because her parents are too busy to spend much time with her. She dreams of an alternative reality – and that is exactly what she finds when she stumbles into a hidden portal to another world. This other existence resembles her own in many ways – complete with an Other Father and Other Mother – but seems at first to be far more perfect than real life. However, as time progresses Coraline slowly realizes the price of perfection is too high, as her alternative parents’ behavior grows creepier and ever more demanding, to reach a threatening climax. Meanwhile, Coraline has a number of intriguing encounters with the other neighbors in the building, including two older sisters and a man who keeps a mouse circus. This is a visually beautiful movie that will appeal most to fathers and older children who enjoy macabre themes and whose nerves are not easily rattled. For them, the film is likely to be a revelatory ride.